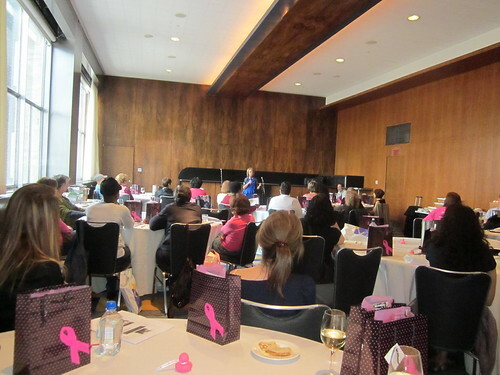 On September 28th, 2012 Myriad partnered with Living Beyond Breast Cancer (LBBC) to educate breast cancer survivors at the Annual LBBC Conference about Hereditary Breast and Ovarian Cancer syndrome. In a very casual setting atop the 33rd floor of the Loews Hotel in downtown Philadelphia, Cynthia Kimball – patient advocate and breast cancer survivor and Jill Stopfer – genetic counselor from the Abramson Cancer Center, enlightened the group about the importance of knowing your family history and assessing your risk for hereditary cancer. Cynthia Kimball has been telling her story for several years to anyone who will listen. Because of her personal and family history, she has a passion for raising awareness about Hereditary Breast and Ovarian Cancer syndrome. She has five sisters and all five have tested positive for the BRCA gene mutation which was passed down from their father. Four of Cynthia’s sisters have had breast cancer and sister, Tammy, is the one sister who has not had cancer. Tammy has taken preventive measures to ensure she does not get breast or ovarian cancer and is considered a Previvor. Everyone left with lots of goodies!! Because it was the last day of National Hereditary Breast and Ovarian Cancer Syndrome week (which includes Previvor Day) and the beginning of National Breast Cancer Awareness Month, a lovely gift bag was provided to help everyone celebrate. 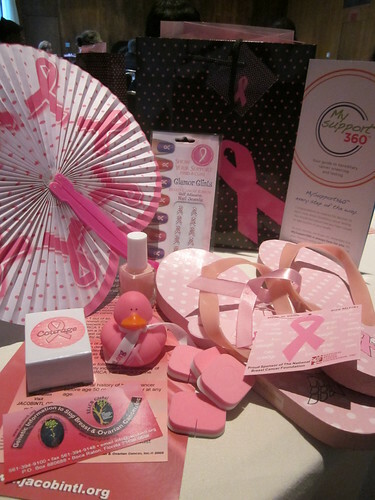 JACOB (Jews Against Cancer Of the Breast) donated an incredible gift bag filled with all sorts of pedicure tools. The most important being pink nail polish to ensure the teal from Septembers National Ovarian Cancer Awareness month was promptly covered in pink for October breast awareness! The event was very successful. Thirty-two women left the evening knowing more about the importance of their personal and family history of cancer. The hope is that they take the information and talk to their families. Not everyone is appropriate for genetic testing but if the family history indicates… the knowledge from testing is very powerful.